Born Madison, Wisconsin, October 3, 1954; married; 2 children, 3 stepchildren, 5 grandchildren. Graduate River Valley High School (Spring Green), 1972; B.B.A. University of Wisconsin-Whitewater, 1976. Certified public accountant (CPA); certified fraud examiner (CFE). Member: St. John’s Catholic Church Spring Green (finance committee member); Taliesin Preservation Inc. Board of Trustees (treasurer); National Rifle Association (member). 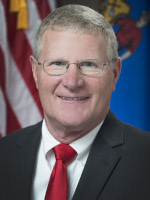 Former member: University of Wisconsin-Whitewater National Alumni Association (president); University of Wisconsin-Whitewater Foundation (board of directors presi¬dent); Fort Health Care Board of Directors (chair, treasurer); Fort Atkinson Rotary Club (president); Fort Atkinson Chamber of Commerce (president); Whitewater Chamber of Commerce (president); Dodgeville Chamber of Com-merce (vice president). Recipient: WMC Working for Wisconsin Award 2018, 2016, 2014, 2012; MMAC Champion of Commerce Award 2018, 2016, 2014, 2012; Wisconsin Pork Association Distinguished Service Award 2013; Wisconsin Newspaper Association Badger Award 2013; Wisconsin Aquaculture Association Legislator of the Year 2013; Dairy Business Association Legislative Excellence Award 2018, 2016, 2012; Wisconsin Auto Collision Technicians Association Legislator of the Year 2016; Wisconsin Towns Association Friend of Towns 2016; Associated General Contractors Legislator of the Year 2016; Wisconsin Counties Association Out¬standing Legislator 2018, 2016; Wisconsin Builders Association Friend of Housing 2018, 2016, 2015; Wisconsin Association of Local Health Departments and Boards & Wisconsin Public Health Association Friend of Public Health 2018, 2016; Wisconsin Hospitals Association Health Care Advocate Award, 2018; Associated Builders and Contractors, Building Wisconsin Award, 2014, 2018; League of Wisconsin Municipalities, Municipal Champion Award, 2016, 2018;National Federation of Independent Businesses, Guardian of Small Business Award, 2018; University of Wisconsin Platteville, Friend of UW Platteville Award, 2018; Wisconsin Grocers Association, Friend of Grocers, 2018; Wisconsin Agri-Business Association, Friend of Wisconsin Agri-Business, 2018; Wisconsin ATV/UTV Association, President’s Award, 2017; Wisconsin State Telecommunications Association, Excellence in Legislative Leadership Award, 2018. Elected to Assembly 2010–2012. Elected to Senate since 2014. Leadership positions: President Pro Tempore 2019, 2017.